Moving day has come and gone. My room-mate and I look a long bike ride passing through many different neighbourhoods including the Plateau, the McGill Ghetto, Centre-Sud, Hochelaga and Rosemont. There was tonnes of stuff out on the streets but we didn’t really find much to take. Regardless, it was a fun ride and I got to see a lot of the city. July 1st is certainly an interesting day but not one that I, as a sort of garbage archaeologist, thrive on. I think it has a lot of appeal to the casual picker, the one who wants to furnish their house or find some cool knick-knacks, some clothes to wear, books to read, records to listen to, and so on. It also has a lot of appeal to professional pickers as well; there’s lots of scrap metal to be salvaged, vintage furniture to be fixed up (like the above), and so on. I’m sure there are treasures to be found too, but I think those tend to come pretty randomly. July 1st, from what I can see, is a moving day mostly for younger, lower to middle class people who haven’t committed to a fixed address. My concept of July 1 might be representative of the places I went. It’s hard to tell what I might have found in NDG, for example, or if as many people would have been moving. It’s definitely far, but my impromptu tour across Montreal ended up being pretty long as well. It was definitely a learning process for me being my first July 1st trash pick. Maybe next year I’ll go out of my way to explore richer neighbourhoods, but I might just stick to the places closest to home. I think after the “summer of trash” concludes I’ll try to learn a bit about fixing electronics. It’d be a useful skill that goes along well with garbage picking. For instance, I have a big flatscreen monitor in my room that sells for around 40$ not working on Ebay. However, in working condition it sells for close to 200$. Definitely some money to be made there. I went out this morning to Villeray but didn’t find too much. Now that people have moved into their new homes I see a lot of empty boxes out on the curb, which is sort of annoying when you generally keep your eyes open for big piles of stuff. 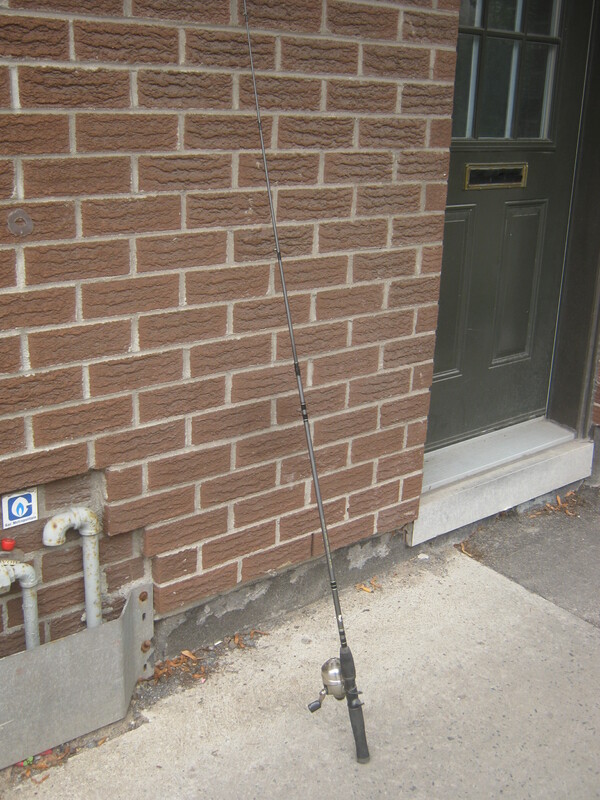 The only thing I brought home was this fishing rod (by Shakespeare, the company not William). It seems to be in fine shape but I don’t know jack about fishing. When my room-mate comes home I’ll ask him what he thinks of it, he has a lot more fishing experience than I do. I dusted off the hanging lamp from yesterday and found a patent date – 1929. I knew it was vintage but didn’t really think of it as being that old! It was made by a S.R.L. Co. out of New York but I couldn’t find any reference to them on Google. I’m going to do my usual Plateau run later this afternoon but I’m looking forward to a day of rest tomorrow! http://www.collectorsweekly.com/categories has info on lots of collectables, and offer weekly emails on each of the categories. love that old wood in the old furniture up top. shame it can’t be save by someone. ran accross an article, and thought of you..
the NY times mentioned the July 1 moving day in Montreal in an article today – sounds hectic, everyone trying to move at the same time. 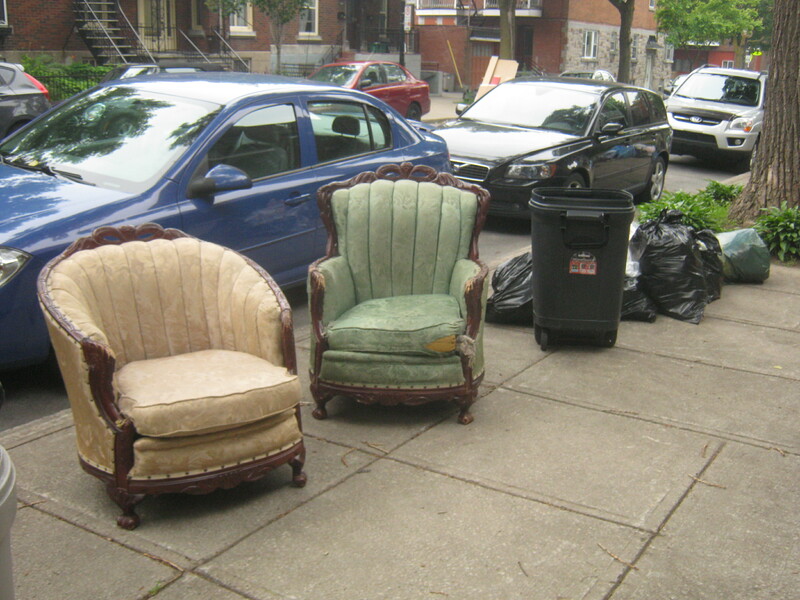 Those chairs are great – if I lived nearby I would take them. I read the article in The New York Times.It was fabulous.I have toured the streets of Montreal in three boroughs since July 1.Those ridings are Verdun,Sud-ouest and downtown.A lot of the good discarded furniture in Verdun was picked up by people going around in vans.In Ville Marie borough,I found a lot of discarded books just next to tall recycling plastic bins on Tupper street in Shaughnessy vilage three hours ago,just before the recycling trucks were supposed to come on Wednesday morning.I rescued three great novels by Somerset Maugham and a dozen great books and took them home.A neighborhood resident told me the books had been discarded about 24 hours ago.I am surprised so many great books remained untaken until I rescued ’em just in the nick of time.I did not find too much discarded furniture in decent condition even in Shaughnessy village .The scavengers had rescued the good furniture.I walked up on Seaforth Avenue,Cedar Avenue,and found 30 big beer cans with a dêposit value of 20 cents each on Seaforth.I took them and took them to the supermarket Provigo where I got $6 for the trouble.I also checked St.Henri near Corona Theatre but found little of interest.This year a lot of scavengers seem to have jumped on the opportunity to rescue valuable discarded stuff.More power to people like you and me. later this week since July 1.Many people are still transporting stuff from storage lockers.Visit Verdun Ouest on Wednesday night or Thursday morning;also visit Ahuntsic/Cartierville,Ville St .Laurent and Montreal Nord within the next four days depending on their recycling and garbage pickup schedule.You will find probably valuable stuff within the next few days because the number of scavengers diminishes a couple of days after July 1.But you must visit far-way areas within the next four or five days and put in long sessions.This is critical. I am going to check out the steets of western Verdun tonight for interesting garbage.I will check out the furniture and open boxes of trash on the sidewalks;I will also open and poke into many plastic recycling bins and garbage bins on the sidewalk.Hopefully I will be able to do seven or eight streets from one end to the other.I am hoping a few others will check out all the recycling bins there for geegaws,valuable books,photos,antiques and surprises .Western Verdun is too big for me to cover alone.I only do this once in a blue moon.Your blog inspires me. You should have a girlfriend or boyfriend who scavenges with you.You would cover more streets that way,be able to carry more stuff and in general discover more treasures.Your friend could do the same neighborhood as you or go to another borough.Nobody talks about several boroughs on your blog,despite your once productive trip to Ville St.Laurent and Verdun. It’s so amazing the treasures you can find. We picked up a similar art deco tub chair to the ones in your top picture, on one of our ‘inorganics’ curb side collection days (NZ)……. and we got it restored and recovered in beautiful leather – it is now the best seat in the house. Wow, quite impressed with the result! I hope other people think to do this, it’s a great way to reduce waste. Someone entrepreneurial could also make a lot of money!